Tea. It is our national obsession: we drink 165 million cups of it every day and think there’s nothing a nice brew won’t fix. A good cuppa is a British institution, cutting through class, status and wealth. Yet an afternoon tea is a totally different animal. It’s a celebration, a fancy treat of crust-less sandwiches, delicate pastries, loose-leaf tea, and a whole load of cake. While tea has been popular in the UK since the 17th century, afternoon tea became a meal in its own right in the 1840s thanks to Anna Maria Russell, the 7th Duchess of Bedford, who began serving it to stave off mid-afternoon hunger pangs. Other fashionable ladies soon followed suit. Over time it became an important social occasion: the best china would come out to deliver the tastiest of treats. Sample this delicious ritual today at one of these seven carefully chosen destinations. The Wyld Tea at the Dandelyan bar of this boutique riverside hotel is boozy, beautiful and bends the rules. It boasts a 1970s-inspired menu and a changing array of cocktails created by award-winning bartender Ryan ‘Mr Lyan’ Chetiyawardana to complement it. Everything nods to botany – from the Cake or Death cocktail with its mint-stem infused Caña Brava and nettle cordial to the Blackcurrant and Verbena Battenberg cake. With four courses, each served with a fitting cocktail, this is the perfect choice for the bon vivant. Wyld teas aren’t just for imbibers: there is a ‘boozeless’ option with plenty of hand blended, loose-leaf teas from Camellia’s Tea House. If you don’t fall in love with the Tom Dixon-designed pink leather banquettes, just gaze out at the Thames – the views across to St Paul’s Cathedral are epic. One of the grandest hotels in London, The Connaught has welcomed royalty, politicians and film stars since it opened in 1897. 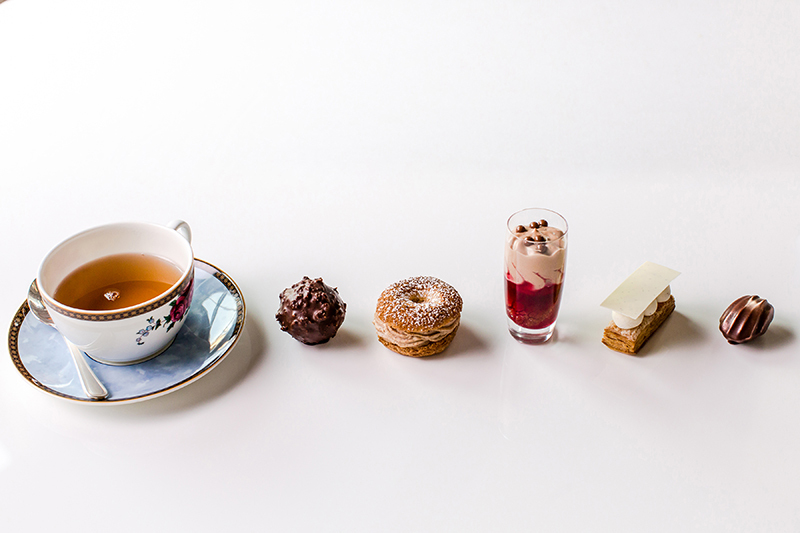 Afternoon tea is now served in the Jean-Georges restaurant, which opened last year. Overlooking Mayfair, guests can’t help but feel that this really is ‘the life’ as they take their first sip of tea (or Laurent-Perrier champagne for an extra kick). There is a traditional savoury start with finger sandwiches filled with English classics such as Coronation chicken or cucumber. The pastries are like jewels: especially tasty is the Orange Blossom with touches of bitter lemon. This gloriously excessive menu is not for those with the appetite of a sparrow, as pastries are followed by a raisin scone with clotted cream and a chocolate fondue. 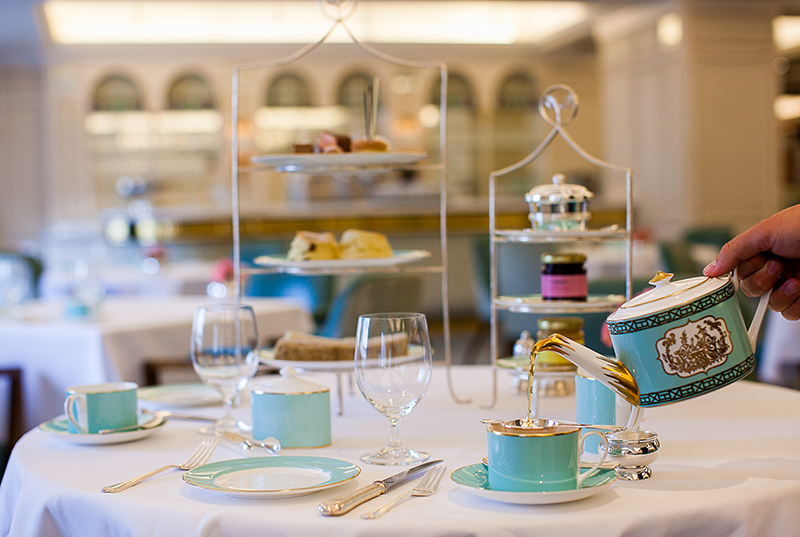 Opened by HM The Queen to mark her 60 years on the throne, the Diamond Jubilee Tea Salon is a calm retreat from the hustle and bustle of the vast Fortnum & Mason fine food department store. The tables are laid with ‘Fortnum’s turquoise’ crockery and fresh flowers on crisp white cloths. The Battenberg cake is a staple, having been served here since 1926. No one is certain about the pink-and-yellow chequered cake’s origins, however. Was it invented to celebrate the marriage of Princess Victoria to Prince Louis of Battenberg in 1884? Wherever it came from, it’s a must-have. 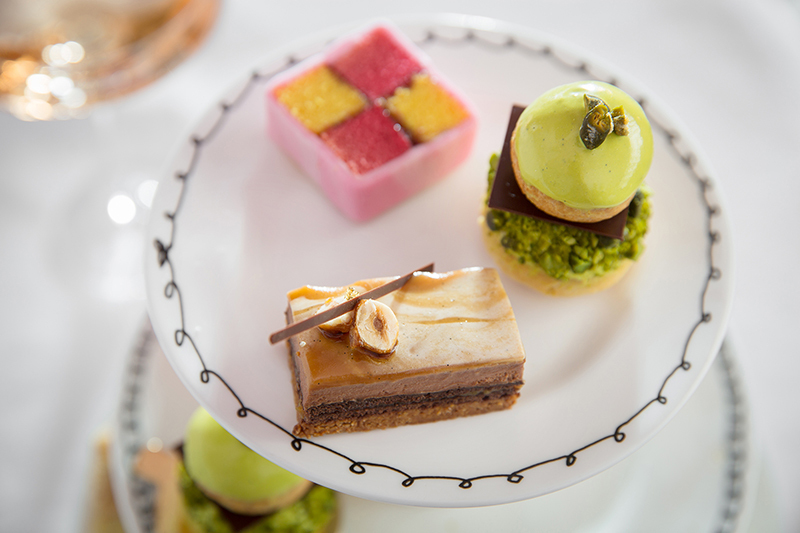 Fortnum & Mason’s tea salon caters for all with thoughtful options for vegetarians, vegans and coeliacs. It also offers a savoury menu for those without a sweet tooth. Arguably, the best thing about this experience is being able to shop for all the ingredients in the food halls afterwards. Bliss! 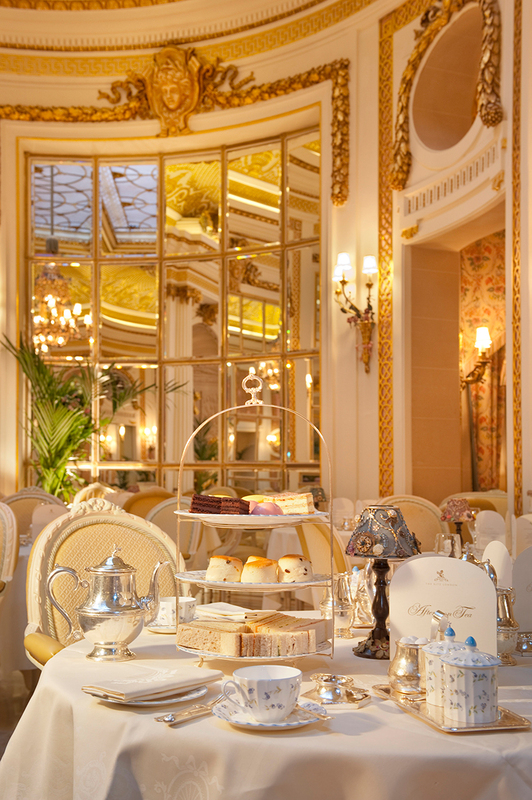 Taking tea at The Ritz is a pretty big deal and you’ll need to dress for the occasion, including jackets and ties for men. Denim and trainers are strictly forbidden too. This most famous of London hotels is right to insist on a dress code. From the moment you are ushered into Palm Court – the camp, gilded theatre of a room in which the afternoon tea is served – you are treated like a VIP. The Ritz is the only hotel in Britain with a certified tea sommelier who visits plantations around the world and offers guests guidance on which of the 18 loose-leaf varieties (including the Ritz Royal Tea Blend) to try. The waiters start by serving a glass of champagne and are attentive, very charming and full of jokes – the days of stiff formality are clearly over. Plates of fresh sandwiches keep appearing so you never finish them and just when you think you might have to be rolled out of there, a cake trolley is wheeled up and you’ll find yourself saying yes to another intricate coconut and milk chocolate confection. The décor in this multi-room Mayfair eatery is surreal to say the least. Afternoon tea is served in the Gallery, which is a joyful assault of powder pink, from the banquettes to the paintwork – it’s like dining inside a gum bubble. Original drawings by David Shrigley adorn the walls, and the British artist’s sense of humour is also writ large on the crockery – your teacup tells you to ‘forget about it’, adding to the off-beat atmosphere. 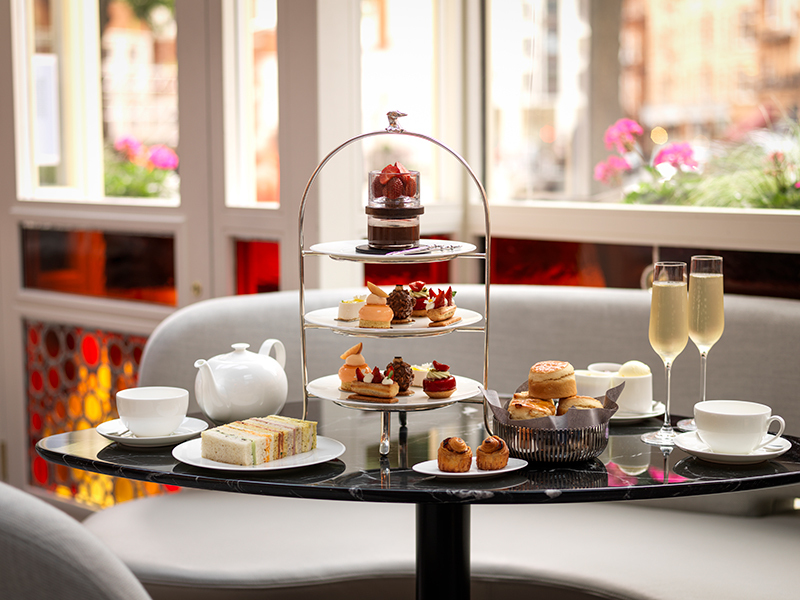 Despite the dedication to aesthetics, Sketch takes afternoon tea seriously. A gold trolley holds more than 40 different jars of tea, including a suitably sweet whole rosebud tea. And do try the fig jam on your scones, a brilliant departure from conventional strawberry. Pommery Brut Silver champagne is also available – an ideal toast to this whimsical tea party. The Langham claims to be the birthplace of afternoon tea, with delicious delicacies and tasty teas served in the Palm Court since 1865. Today, the Art Deco interior continues to be the jewel in the crown of this famous central London hotel. 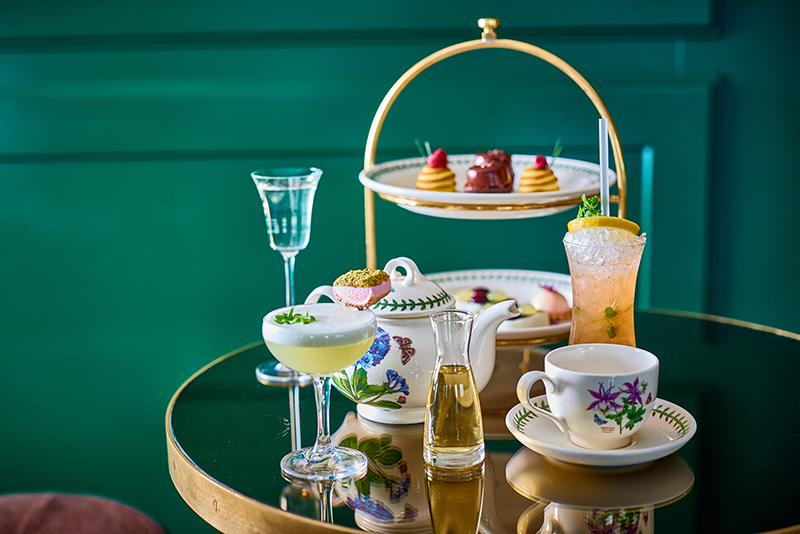 The Wedgwood Afternoon Tea pays scrumptious homage to the celebrated British ceramics company: the entire feast served on ‘Langham Rose’ crockery. Waiters serve sandwiches – Burford Brown egg and Scottish smoked salmon – from trays to your plates, ensuring they are always fresh. Interestingly for such an acceptably indulgent meal, The Langham is on something of a health kick. 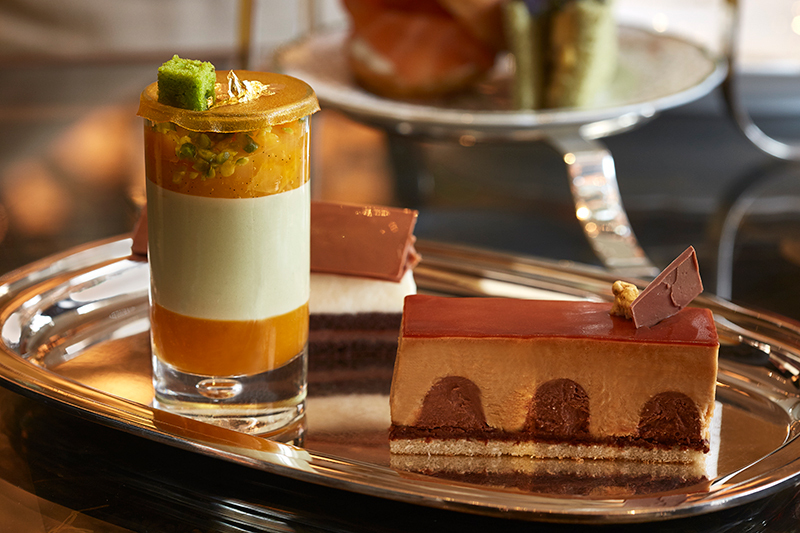 The Art Afternoon Tea at Rosewood London is an ode to the capital’s contemporary art scene. Laid out in the hotel’s Mirror Room, a relaxed but sumptuous space decorated by an abundance of reflective glass, you can expect traditional loose-leaf tea, scones and sandwiches (the Le Madru ham, Comté and mustard gets our vote). When the pastries arrive, all conventionality ceases thanks to the imaginative and intricate art-inspired designs, painstakingly devised by executive pastry chef, Mark Perkins. Each one focuses on a famous work by different artists including Mark Rothko, Damien Hirst and Banksy. 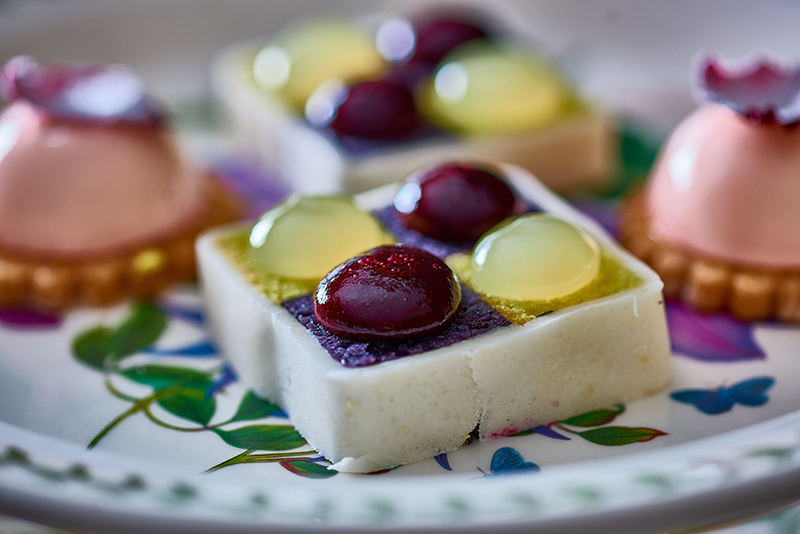 Art lovers won’t take long to guess which is which – Hirst’s distinctive spots decorate a white chocolate and cassis jelly tart, while the Rothko is a coconut sponge cake of different coloured layers. And if you can escape the guilt involved in taking a mouthful out of a mini masterpiece, the Rosewood is an unashamedly modern update on a classic tradition.